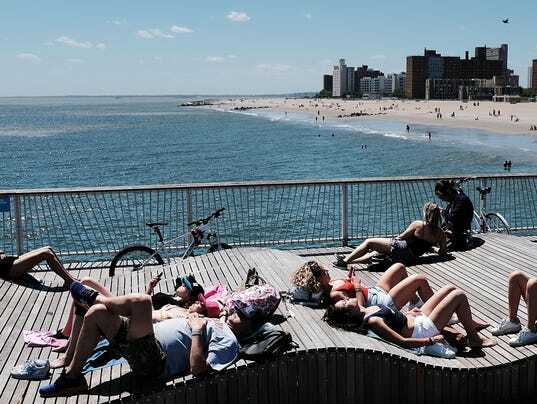 Temperatures across the nation are expected to reach the mid-to-upper 90s this Father’s Day weekend, marking the hottest weather of the season thus far — the intense June sunshine only adding to the heat and humidity. Those impacted by the heat wave, specifically in Central and Northeast United States, are encouraged to stay hydrated and in an air-conditioned environment as the temperatures “will likely lead to an increased risk of heat-related stress and illness.” Portions of the Northeast and Mid-Atlantic are also anticipating record-breaking heat on Monday, with the temperature expected to top off at about 95 degrees. This Sunday, remember to celebrate all the hard-working, dedicated dads and father figures out there. Father’s Day is a well-known tradition celebrated by many, but when did the actual holiday begin? Buzz60’s Sam Berman has the full story. Despite heavy opposition by Greek lawmakers and protesters, Macedonia is expected to start the process of undergoing a name change this weekend. The relatively-new country — one of seven formed after the breakdown of Yugoslavia — declared independence in 1991 but has faced disputes with neighbor Greece that carries deep historical roots, dating back to Alexander the Great. Macedonia’s new name, should the accord pass, will be the “Republic of North Macedonia.” The name change, advocated for by both the Greek and Macedonia prime minister, means that Greece will no longer disprove of Macedonia joining NATO and the European Union. Amazon Prime customers will see a 20 percent increase on Saturday in their subscription, with the annual fee rising from $99 to $119 per year. Even with the rate increase (10.99 to $12.99 for monthly plans,) Reviewed argues that the membership is still worth the investment. With Prime, Amazon users can expect benefits such as free two-day, or even same-day, shipping. Members can also stream movies, shows and music. Four years ago, Prime subscribers paid $79 per year. Amazon raised the price of its Prime membership for U.S. subscribers to add a windfall to the company’s subscription revenue. Aleksandra Michalska reports. World Cup: After Cristiano Ronaldo’s heroics, what will Messi do? Following a frenzied Friday at the World Cup, what will the tournament offer next?Uruguay and Iran earned late wins Friday, but Cristiano Ronaldo’s hat-trick stole the tournament spotlight in Portugal’s epic showdown against Spain. The soccer bonanza rolls on Saturday with a four-match slate, which features Ronaldo’s rival in excellence, Lionel Messi. Messi’s Argentina plays Iceland, which is making its World Cup debut. The day kicks off with one of the tournament favorites — France — playing Australia. Later in the day, Peru faces Denmark and Croatia takes on Nigeria.